Does anyone have a autometer water temp gauge installed on there Turbo Pt ??? Where did you put the sending unit in the block or head at to read the water temp????? This is a question that I would like to know too. 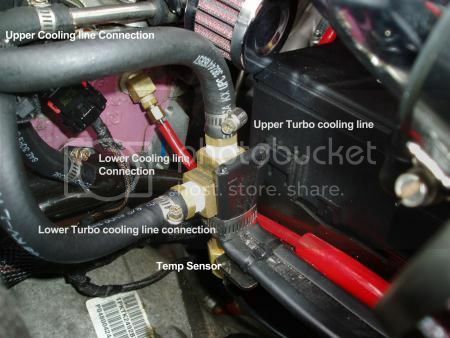 You don't have to drill, The metal turbo water cooling lines are connected by a hose just under the the front elbow of the air inlet pipe between the outlet of the Intercooler and the inlet on the throttlebody. That hose (3/8 ID) can be removed and be replaced by 2 hoses connected to a 1/2: brass Tee fitting. The configuration would be like this: Out of the cooler line on top into one section of thr TEE. Out from one of the other ports in the TEE to the other metal cooler line. A 1/2 in bushing (Long neck) can be used to insert the mechanical temp probe. I know this sounds complicated but it is really not. I'll get some pics tomorrow and add them to this post. The hardest part of the whole thing is routing the temp probe thru the firewall as the probe line, connection to the gauge, and connection to the temp probe are all 1 piece and cannot be disconnected. I have my gauge connected this way, as well as Flashback2. Thats where I got the connection data from. I'll post Pics Tomorrow its too Dark to take good pics now. I was checking this out and I noticed a plug in the side of the head on that side of the motor. Does anyone know if this is a plug for the water jacket or the oil jacket ???? it is an oil plug , if you look on gearheads pic you see his oil sensor in that plug hole. Hey did your electric gauge rad right when you first put it on mine seams to want to jump around. I treads a little below 180 is this right ??? What oil sensor is that hooked into the head on your car also ? ?